The life of Harry S. Truman is one of the greatest of American stories, filled with vivid characters -- Roosevelt, Churchill, Stalin, Eleanor Roosevelt, Bess Wallace Truman, George Marshall, Joe McCarthy, and Dean Acheson -- and dramatic events. In this riveting biography, acclaimed historian David McCullough not only captures the man -- a more complex, informed, and determined man than ever before imagined -- but also the turbulent times in which he rose, boldly, to meet unprecedented challenges. The last president to serve as a living link between the nineteenth and the twentieth centuries, Truman's story spans the raw world of the Missouri frontier, World War I, the powerful Pendergast machine of Kansas City, the legendary Whistle-Stop Campaign of 1948, and the decisions to drop the atomic bomb, confront Stalin at Potsdam, send troops to Korea, and fire General MacArthur. Drawing on newly discovered archival material and extensive interviews with Truman's own family, friends, and Washington colleagues, McCullough tells the deeply moving story of the seemingly ordinary "man from Missouri" who was perhaps the most courageous president in our history. New York : Simon & Schuster, 1992. First Edition. Leather Bound. Like New. Signed. Inscribed by author, David McCullough. Bound in fine royal navy Moroccan leather, inlaid with leather and gilt ruled. 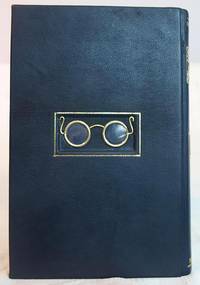 Embossed with a gold portrait of Truman and a facsimile of his signature. Rear board inlaid with faux-spectacles in a compartment. Cover edges heavily stamped with gold. Marbled end pages and marble stained edges. Bound in silk-ribbon book mark. 1117 p.; 25 cm. A special book, hand-made and unlike any other. Please see our pictures of this lovely book. <br> Pulitzer Prize, Biography, 1993. Society of American Historians Francis Parkman Prize, 1993. <br> The wonderful American historian, David McCullough wrote this biography of President Truman in 1992. He drew on archival material and extensive interviews with Truman's family, friends, and Washington colleagues. McCullough??????????Â±? ?s narrative of Truman's life is a rare work of biography that transcends progression of time and creates a palpable, living vision of a man who helped shape the 20th century. Simon & Schuster, 1992 A fine first edition in a fine dust jacket, inscribed by McCullough with long inscription to friends. Complete row of numbers to 1 on the copyright page.. Inscribed by Author(s). 1st Edition. Hardcover. Fine/Fine. Simon and Schuster, 1992 Near fine first edition, signed by McCullough on the title page, in a very good dust jacket but for some reinforcing tape on the inside not visible on the outside. Complete row of numbers from 10 to 1 on the copyright page.. Signed by Author(s). 1st Edition. Hardcover. Near Fine/Very Good. New York: Simon & Schuster, 1992. First edition of the historian's first Pulitzer Prize-winning work. Octavo, original half cloth. Inscribed by David McCullough in the year of publication on the title page. Fine in a fine dust jacket. Jacket and illustration design by Wendell Minor. Hailed by critics as an American masterpiece, David McCullough's sweeping biography of the thirty-third President of the United States. Truman provides a deeply moving look at an extraordinary, singular American. "A warm, affectionate and thoroughly captivating biography....the most thorough account of Truman's life yet to appear" (Alan Brinkley, The New York Times Book Review). New York: Simon & Schuster, 1992. First edition of the historian's first Pulitzer Prize-winning work. Octavo, original half cloth. Inscribed and dated by David McCullough on the title page. Fine in a fine dust jacket. Jacket and illustration design by Wendell Minor. Hailed by critics as an American masterpiece, David McCullough's sweeping biography of the thirty-third President of the United States. Truman provides a deeply moving look at an extraordinary, singular American. "A warm, affectionate and thoroughly captivating biography....the most thorough account of Truman's life yet to appear" (Alan Brinkley, The New York Times Book Review). New York: Simon & Schuster, 1992. First edition of the historian's first Pulitzer Prize-winning work. Octavo, original half cloth. Presentation copy, inscribed and dated by the author in the month of publication on the title page, "For Marty and Gina with best wishes for your future together David McCullough Independence June 20, 1992." Near fine in a fine dust jacket. Jacket and illustration design by Wendell Minor. Hailed by critics as an American masterpiece, David McCullough's sweeping biography of the thirty-third President of the United States. Truman provides a deeply moving look at an extraordinary, singular American. "A warm, affectionate and thoroughly captivating biography....the most thorough account of Truman's life yet to appear" (Alan Brinkley, The New York Times Book Review). 1992-08-09. New. Ships with Tracking Number! INTERNATIONAL WORLDWIDE Shipping available. Buy with confidence, excellent customer service! New York: Simon & Schuster, 1992. First Edition. Tenth Printing. very good, very good. 1117, illus., source notes, bibliography, index, slight wear to DJ. Inscribed by the author. A monumental biography of an extraordinary president, Harry Truman--the man who brought the country solidly into the 20th century. Drawing from archival materials and extensive interviews, McCullough chronicles Truman's life, but it is Truman's emergence as a decisive and confident president that forms the heart of this book. Simon & Schuster. PAPERBACK. 0671869205 Brand new book.Buy with confidence. Money Back Guarantee.Expedite Shipping Available. International shipment available. . New. Simon & Schuster, 6/15/1992. Hardcover. Very Good. Signed. Signed by author, David McCullough on title page. 3rd printing. Pulitzer Prize, Biography, 1993. Hardcover and dust jacket. Good binding and cover. Price clipped. Light foxing to side page end. Clean, unmarked pages. Ships daily. Simon & Schuster, 6/15/1992. Hardcover. Very Good. Signed. 4to. Inscription by author, "For Chase Stephens, Best wishes to the man who helped see Truman off in Washington at the end of his White House years, David McCullough 6/29/92. Very light foxing to edges. Good binding and cover. Hardcover and dust jacket. Ships daily. 2015-06-01. New. Ships with Tracking Number! INTERNATIONAL WORLDWIDE Shipping available. Buy with confidence, excellent customer service! 1992-05-08. New. Ships with Tracking Number! INTERNATIONAL WORLDWIDE Shipping available. Buy with confidence, excellent customer service! 1993-06-02. New. Ships with Tracking Number! INTERNATIONAL WORLDWIDE Shipping available. Buy with confidence, excellent customer service! 1992-06-08. New. Ships with Tracking Number! INTERNATIONAL WORLDWIDE Shipping available. Buy with confidence, excellent customer service! Simon & Schuster. Used - Very Good. Very Good condition. New York: Simon and Schuster, 1992. Cloth. Collectible; Very Good/Very Good. SIGNED BY DAVID MCCULLOUGH on the title page. A clean copy to boot of the 1992 5th printing. VG in a bright, price-clipped, VG dustjacket. Thick octavo, 1,117 pgs. Signed by Author. Simon & Schuster, New York, 1992. Later Edition. Hardcover (Half Cloth). Very Good Condition/Very Good. Signed by Author. McCULLOUGH, DAVID. Truman, New York: Simon & Schuster, 1992. Quarto, early printing, pp. 1117, 48 pages of halftone photos, quarter-bound in navy cloth over blue paper-covered boards, silver lettering on spine, blind-stamped on front, signed by McCullough on the title page. With a leaflet advertising a McCullough appearance at a library, presumably where he signed this book. Pulitzer Prize-winning historian's definitive (and readable) biography of the common man from Missouri who gets thrown into the presidency at a key moment. The Easton Press, 1994. Reissue. Full-Leather. Near Fine/No Jacket. Publisher's insert and blank bookplate laid in. 1994 Full-Leather. We have more books available by this author!. Complete in two volumes. 1117,  pp. 8vo. Original full leather, gilt titles and decorations, all edges gilt, ribbon marker bound in. "Hailed by critics as an American masterpiece, David McCullough's sweeping biography of Harry S. Truman has captured the heart of the nation. The life and times of the thirty-third President of the United States, Truman provides a deeply moving look at an extraordinary, singular American. From Truman's small-town, turn-of-the-century boyhood and his transforming experience in the face of war in 1918, to his political beginnings in the powerful Pendergast machine and his rapid rise to prominence in the U.S. Senate, McCullough shows, in colorful detail, a man of uncommon vitality and strength of character. Here too is a telling account of Truman's momentous decision to use the atomic bomb and the weighty responsibilities that he was forced to confront on the dawning of a new age. Simon &amp; Schuster, 1992. Hardcover. New. 9.25 x 6.12 cm. Norwalk, CT: Easton Press. As New. 1994. Full-Leather. A wonderful limited scarce book in As New condition, still in its original shrink-wrap; The biography of Harry S Truman (1884-1972) , 33th President of the United States (1945-1953). From simple beginnings on the western Missouri frontier, Truman became president and eventually the driving figure for reconstructing America's foreign policy after World War II, establishing the Defense Department, and the CIA, even though some insisted on calling him an "ordinary man", Volume 2. Contains all of the classic Easton Press trimmings: premium leather, silk moiré end leaves, distinctive cover design, raised bands, accented in real 22KT gold, satin ribbon page marker, gilded page edges, long-lasting, high quality acid-neutral paper, sewn pages for strength and durability; Vol. 2 . Seller: Books Tell You Why, Inc.
New York: Simon & Schuster, 1992. Early printing of the historian's first Pulitzer Prize-winning work. Octavo, original half cloth. Boldly signed by David McCullough on the title page. Fine in a near fine price-clipped dust jacket. Jacket and illustration design by Wendell Minor. Hailed by critics as an American masterpiece, David McCullough's sweeping biography of the thirty-third President of the United States. Truman provides a deeply moving look at an extraordinary, singular American. "A warm, affectionate and thoroughly captivating biography....the most thorough account of Truman's life yet to appear" (Alan Brinkley, The New York Times Book Review). Simon and Schuster, 1992. Uncorrected Proof. Very large, thick softcover, 1082 pages. Light blue line near top front right, light crease near bottom back left. Near Fine copy.. Soft Cover. Near Fine. Uncorrected Proof. Easton Press. Volume 1 Only, Gift Condition, Sharp Corners, Clean, Tight, Square, No Markings, Beautiful Gilt Over Spray On Page Block Edges, Gilt Lettering And Design On Burgundy Covers And Spine, Email For Pictures . Very Good. Leather with Gold Guild. Easton Press Edition. 1994. Simon & Schuster. Fine in Near Fine dust jacket. 1992. SIGNED; First Printing. Hardcover. 0671456547 . Fine blue half-cloth hardback in a NF price clipped dust jacket. Author inscribed thus: "To Congress Gonzalez with admiration, David McCullough". Henry B. Gonzalez was an eighteen term congressman from San Anontio. Henry B died in 2000 at the age of 84. Looks like new in a new mylar protective cover. This big and heavy book will be shipped promptly in a new cardboard box with bubble wrap protection. USPS tracking included. ; 9.4 X 6.3 X 2.5 inches; 1120 pages; Signed by Author . Norwalk, CT: The Easton Press, 1994. Collector's Edition. Leather bound. Very good. 1117pp. Octavo [24 cm]; Purple leather with raised bands, a gilt stamped title on the spine, and decorative gilt stamped patterns on the spine and covers. All edges gilt. Patterned endpapers. Easton Press bookplate and Publisher's Collector's Notes tucked in Volume I. Minor scuffing to cover of Volume I. Part of The Library of the Presidents. 1992-06-08. Good. Ships with Tracking Number! INTERNATIONAL WORLDWIDE Shipping available. May not contain Access Codes or Supplements. May be ex-library. Shipping & Handling by region. Buy with confidence, excellent customer service! 2008-06-26. Reprint. Library Binding. Good. New York: Simon & Schuster. Near Fine in Near Fine dust jacket. 1992. Later Printing. Hardcover. 9780671456542 . Gently read copy. Bumped bottom corner. International orders may require additional postage. ; Simply signed on a bookplate by David McCullough. Full number line. ; 10.71 X 6.30 X 2.44 inches; 1120 pages; Signed by Author . New York: Simon & Schuster. Very Good+ in Very Good dust jacket. 1992. First Edition; First Printing. Hardcover. 9780671456542 . Gently read copy with some edgewear to dustjacket. Now protected in a clear mylar cover. International orders may require additional postage. ; Inscribed on the title page by David McCullough. Full number line. ; 10.71 X 6.30 X 2.44 inches; 1120 pages; Signed by Author . Simon & Schuster. Fine in Fine+ dust jacket. 1992. Second Revised Edition; Sixth Printing. Hardcover. 0671456547 . Book with a channel at spine, else VF, square, tight, clean. DJ not price clipped ($30) with no defects. Remains of a book label at front paste down (hidden by DJ flap) else no other names, notes, or ANY markings. ; Photos; Thick 8vo; 1116 pages; Flat signed by McCullough at title page. Book ships in a box, USA. ; Signed by Author . New York: Simon & Schuster. 1993. First Edition; Thirteenth Printing. Softcover. 0671869205 . Near Fine in wraps. Light shelf wear on bottom/side edges of text block. ; 9.0 X 6.1 X 2.2 inches; 1120 pages; All domestic orders shipped protected in a Box. . SIGNED and briefly INSCRIBED by McCullough. Near fine (previous owner's signature and date on front end paper, rubbing on front board) in like dust jacket (tiny tear at upper front corner). A collectible copy. Norwalk, Connecticut: EASTON, 1994. Collector's Edition. Full Leather. Near Fine. Two volume set in burgandy leather. Gilt foredges and design. Four raised bands on spine. "Collector's Notes" laid in. Norwalk: Easton Press. Fine. 1994. Leather. 4to. Two Volumes, bound in full leather with raised bands, gilt tooling to spines and covers, and decorated end papers . Library of the Presidents. We specialize in fine books in collectible condition. Orders are professionaly packaged and shipped promptly. P24 . Simon & Schuster. PAPERBACK. 0671869205 New Condition. . New. New York: Simon & Schuster, 1992. Book. Very Good +. Hardcover. First Edition/First Printing. A square solid tight un-read copy of the Pulitzer Prize winning book. This copy has just a hint of pagedge soil, slight curvature of the text block at the top of the spine, the name of a previous owner neatly written on the FFEP, a notary type blind stamp from a previous owner to the FFEP. This copy, huge at 1100+ pages has NONE of the wear and lean usually associated with a book this size. The jacket is PC else fine. THIS COPY IS IN MY POSSESSION AND NORMALLY SHIPS NEXT DAY..
New York: Simon & Schuster, 1992. Book. Very Good +. Hardcover. First Edition/First Printing. A square solid tight over-all clean very carefully read copy of the Pulitzer Prize winning book. This copy has some veryyyyyyyyy light pagedge soil, some light rubbing wear in the spine area, the spine is slightly concave. The 30.00 jacket has some light rubbing wear,some edgewear, a short closed tear at the bottom of the front fold. This copy,huge at 1100+ pages has NONE of the wear and lean usually associated with a book this size. THIS COPY IS IN MY POSSESSION AND NORMALLY SHIPS NEXT DAY. New York: Simon & Schuster, 1992. First edition. Hardcover. Hardcover. First edition. Fine book in a fine dust jacket. A bright, pristine copy. Bottom rear board is lightly bumped. Small owner sticker on front pastedown. The true first edition with the correct number line down to "1." Winner of the Pulitzer Prize. 1992-08-09. Good. Ships with Tracking Number! INTERNATIONAL WORLDWIDE Shipping available. May not contain Access Codes or Supplements. May be ex-library. Shipping & Handling by region. Buy with confidence, excellent customer service! SIMON & SCHUSTER. New. 9.16 x 6.2 cm. New York: Simon & Schuster. Near Fine in Fine dust jacket. 1992. Third Printing. Hardcover. 9780671456542 . Gently read copy. International orders may require additional postage. ; Inscribed on the title page by David McCullough. ; 10.71 X 6.30 X 2.44 inches; 1120 pages; Signed by Author . New York: Simon and Schuster, 1992. First Edition. Hardcover. Fine/fine. Octavo, 1117pp., illustrated. About fine, with the spine a bit cupped, which is normal for this massive title. In a fine, bright dust jacket. SIGNED by McCullough on the title page. New York: Simon & Schuster, 1992. Inscribed by McCullough 'all best wishes' and dated 1993. Bit of a concave spine from being read. Still nice. Jacket priceclipped. A later printing. . Inscribed By Author. Later Printing. Hard Cover. Very Good+/Very Good+. New York: Simon & Schuster, 1992. Book. Very Good +. Hardcover. First Edition/First Printing. A square solid tight carefully read copy read copy of the Pulitzer Prize winning book. This copy has just a hint of page edge soil, slight curvature of the text block at the top of the spine, lightish wear in the spine area. This copy, huge at 1100+ pages has NONE of the wear and lean usually associated with a book this size. THIS COPY IS IN MY POSSESSION AND NORMALLY SHIPS NEXT DAY..